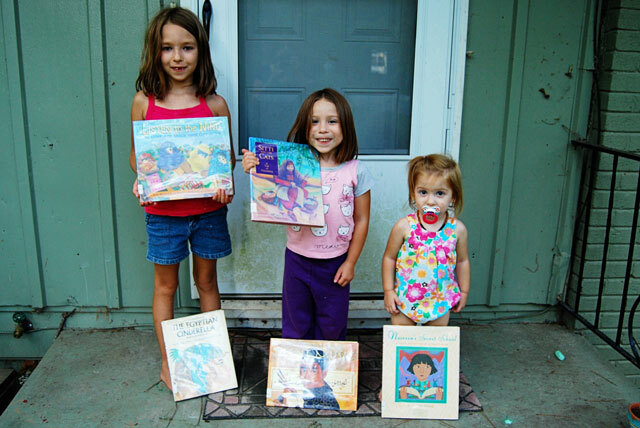 See this post for an explanation of this Summer Book Club. 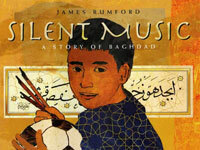 Check out the Middle East post at Simple Homeschool, for free printables and other ideas. I’m behind again. :) Week 5 was actually last week, and we are still working our way through the books. The Middle East is a tough area of the world, and Jamie Martin (the author) chose to only include books on her list starting at age 6. (Instead of age 4, like the other regions.) Fortunately, Savannah seemed to take mentions of bombs and soldiers in stride, but I could see caution being warranted for a more sensitive child. Also, another heads up – many of these books reference Islam. This was a great way to jumpstart a discussion with Savannah about it (we’ve already talked about not everyone believes in Jesus, and how some people have their own gods and religions), but I wanted to mention it in case anyone else is bothered by that. 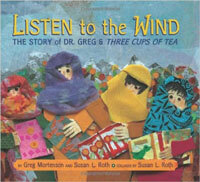 ** We loved the artwork in this book – it’s done collage style, so very creative. I also really liked the story. It didn’t feel like a “white man savior!” type, but rather a story of how a village community comes together to build a school. We talked about high mountains and remote villages, which is something we haven’t really talked about much. Poor Rhodopis! She has nothing – no mother or father, and no friends. She is a slave, from the far-off country of Greece. Only the beautiful rose-red slippers her master gives her can make Rhodopis smile. So when a falcon swoops down and snatches one of the slippers away, Rhodipis is heartbroken. For how is she to know that the slipper will land in the lap of the great Pharoah himself? 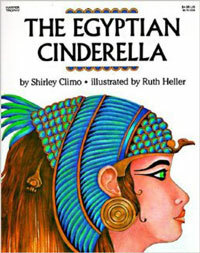 And who would ever guess that the Pharoah has promised to find the slipper’s owner and make her queen of all Egypt? ** Savannah loved the Cinderella aspect of this story! This an old story that is a blend of truth and legend. The illustrations are reminiscent of ancient Egyptian art. We didn’t go very deep with it, but you could definitely turn it into a lesson of the value of people despite their physical appearance or social station. A beautiful Palestinian folktale teaches the golden rule. ** I accidentally got a little overzealous with putting library books on hold for this week and probably checked out too many. ;-) I added this one to the hold queue because it was about cats, of course. 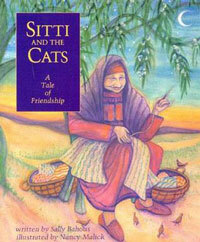 It’s a really sweet story of an old woman who shows kindness to a little cat in her time of need, and in return the cat blesses her. However, full disclosure, I’m probably not going to read this one to my kids. It’s one of the longer stories and I don’t want to get even further behind. It’s good to know our library has it, though – I will likely check it out at another time! Like other children living in Baghdad, Ali loves soccer, music and dancing, but most of all, he loves the ancient art of calligraphy. When bombs begin to fall on his city, Ali turns to his pen, writing sweeping and gliding words to the silent music that drowns out the war all around him. Gorgeously illustrated with collage, pencil and charcoal drawings and, of course, exquisite calligraphy, this timely and yet universal story celebrates art and history but also offers young children a way to understand all they see and hear on the news. ** I really loved this book! It was a really cool look at calligraphy and how writing in other countries can look different. Savannah was fascinated by that, and I think it blew her mind that some languages read right to left, ha. I loved how this book was celebrating the beauty of the language while still acknowledging the realities of the turbulence of the region. Young Nasreen has not spoken a word to anyone since her parents disappeared. In despair, her grandmother risks everything to enroll Nasreen in a secret school for girls. Will a devoted teacher, a new friend, and the worlds she discovers in books be enough to draw Nasreen out of her shell of sadness? Based on a true story from Afghanistan, this inspiring book will touch readers deeply as it affirms both the life-changing power of education and the healing power of love. ** Heads up, this book is not for the sensitive child. It starts with a young girl, Nasreen, living in Afghanistan whose father was taken by Taliban soldiers, and her mother disappears looking for him. It is told from the perspective of Nasreen’s grandmother who desires more for her granddaughter. 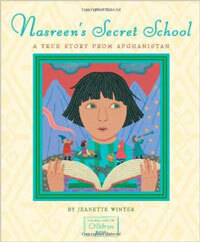 She finds a secret school for Nasreen where she will be able to learn, something that is forbidden for girls. The story doesn’t have a happy feel-good ending, but it does end with hope that Nasreen will have more opportunities for her thanks to her school. I thought the story was sobering, and such a sad look at how oppression can affect a whole culture, and also the bravery of people who seek to educate themselves anyway. I hope my girls realize that their education is a gift that is denied to many. I think the full depths of this story is lost to Savannah, but I am glad for the chance to talk about this with her right now.